I remember my first conversation with Juan Gabriel. I sat across from him in the dining room at his house in El Paso, Texas. He was tired, he admitted to me, of touring in the US, and everywhere else for that matter. He said that people only saw him as a meal ticket, a way to get rich quick. He said plainly that if that was what I was trying to do, I should line behind every other promoter who could probably deliver more and what he was used to already. I asked him what he meant by that, and he took a sip from a glass of fresh tomato and ginger juice his homemaker Luisa, had just squeezed for us, and he began to recount his experience as a major touring act in Mexico, the US and Hispanic America. It was 1988, he was just realizing how big he had become. He was emerging as the voice of a generation of immigrants eager to make their mark in an America that was already beginning to feel the seismic shift of Latino immigration and native births. He told me about a concert of his at the Greek Theater where the tickets were being sold for $250 USD each. And when he asked why he wasn’t seeing those numbers reflected in his final settlement, he was told by the promoter that he had been used as the draw for a local campaign fundraiser. When he asked what his “cut” was and why he hadn’t been informed, the reply was simply, “you didn’t ask.” Besides, the promoter assured him, you’re getting paid what was agreed to. He looked me straight in the eye and said “no más.” He meant that he would never do another concert at the Greek Theater. I asked him why didn’t he go to the Universal Amphitheater, at the time an up and coming venue attracting A-list acts under the management of seasoned concert promoters like Jay Marciano and Larry Vallon (I drop names here because in LA, sadly, “who” you know will always trump “what” you know). A few weeks before that, my wife and I had been guests at a Lionel Ritchie concert courtesy of Tom Rubin, an up-and-coming media mover and shaker intent on taking over the LA pop culture scene that were beginning to blur the lines between entertainment and advertising. It was the Wild West of media and Rubin realized that rock and roll and strategic cross-cultural alliances were good for business. So Rubin set up a meeting with Valon, and the rest was history. Juan Gabriel changed his Los Angeles venue to the amphitheater and never looked back, breaking box office records for attendance and concert receipts. Juan Gabriel had become a cross-cultural phenomenon at a time when the US was experiencing a wave of immigration from Mexico and Central America. Univision Communications became a legitimate media vehicle for the throngs of hungry advertisers eager to increase market share by tapping into this ready and willing consumer segment that had a tremendous appetite for everything American; cars, trucks, diapers, fast food, entertainment, soda, beer, cigarettes, Hamburger Helper, you name it. At one time, musical acts from Mexico and Latin America comprised over 60% of the Universal Amphitheater’s annual slate, generating millions in revenue for the Universal. Juan Gabriel helped his fellow immigrants define what it meant to be Mexican in a foreign land. With that came a huge responsibility because he carried the hopes and aspirations of an entire generation of “new Americans” on his shoulders and brands and promoters came out of the woodwork to cash in. They offered sponsorship, contracts for endorsement, record deals, television specials and on and on. But he would stay with what he knew best: touring. Singing live is how he preferred to establish a rapport with his public, and it was how he felt he could best contribute at least one joyful moment to their otherwise dreary, work-centered immigrant existence in the U.S. If you think racism is bad now, imagine what people were going through when racism was still in the closet and not being covered by the mainstream media. 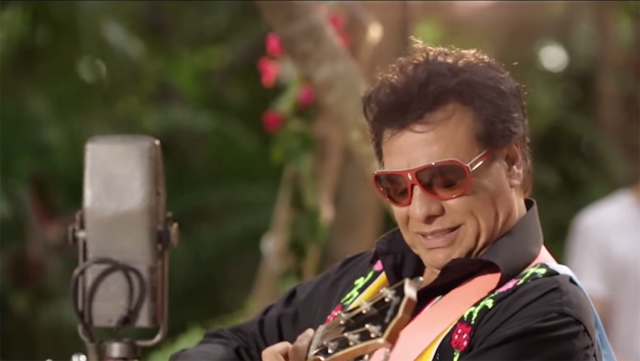 The rise of Juan Gabriel was paradoxical. On the one hand, it grounded people, reminding them of their roots and culture. His songs touched the core of what it meant to be a Mexican, in love, life, death and in betrayal. He kept people connected to the emotions that their newly adopted culture lacked. Americans didn’t tend to dwell on or think about feelings or experience with a similarly acute yearning to belong. They thought about individual endeavor and what was good for the short term. Mexicans, on the other hand, have always needed to remind one another that community is the cornerstone of success. And for them, those 6,000 people singing the same songs aloud, all the lyrics memorized perfectly, rubbing shoulders with other paisanos, intoxicated by sips of distilled maguey mixed with the palpable sense of communion with fellow travelers who know how difficult life in the U.S. can be, Juan Gabriel sang the truth about their lives. His music defined this dynamic because wherever he performed, a wave of die-hard fans came, and they never tired of the three-hour marathon concerts and the repertoire of hits that never seemed old, that never veered from hitting their mark in the center of the Mexican subconscious psyche. Lines from the lyrics to one of his songs say something like “quiero beber de tus labios el agua de tu amor divino… para eso vengo a escucharte, no quiero morirme de sed…” (I want to drink the water of your love from your lips… for this I come to hear you, I don’t want to die of thirst). On the side of the paradox, the bigger he became, the more money he made. And the more money he made, the more he spent. And the more he spent, the more he had to work. The media magnate paid a record $35 million for two Spanish language radio stations in Los Angeles, easily the 2nd largest U.S. media market overall and the number one U.S. Hispanic market. I use “Hispanic” here because that was the vernacular of the day. As our marketing analytics evolved, so did the industry terminology. I was a bridge builder who understood both sides of the paradox. A couple of years earlier, I created a family festival designed to provide a safe, trusted place for immigrant Latino families to gather around music, food and entertainment in large enough numbers that it would be reminiscent of a feria from back home. I called it “Festival Sin Fronteras” alluding to the imaginary and arbitrary line through the desert that divides Baja California and Alta California. Being from New Mexico, I was raised thinking there wasn’t much of a difference, an idea gleaned from my Mexican grandfather, a native of Durango who migrated to the U.S. and could do the work of two or three men, much to the delight and amazement of his Americano (read Gringo) bosses. After the launch of Sin Fronteras, which my Mexican-born wife and I funded ourselves, I got a call from the new owners of the radio stations I had partnered with to promote the festival. They congratulated me for a having the super-sized vision and the set of even bigger stones it took to make it happen. They had, as a result of my success, decided to approach Juan Gabriel and make him a partner by buying out his contracts with a wild patchwork of Mexican promoters and working with him, through me, to harness the growing economic power of the Hispanic market segment. During the course of our negotiations, I visited him in three of his homes. He preferred to do business in familiar surroundings so as to be near his first son, Ivan, who still was only a toddler as possible whenever he had some down time. Some of that down time was spent listening to me go on about how the new owners of KLVE and KTNQ radio in Los Angeles wanted to go into business with him and manage all his affairs. They were prepared to offer him $1 million for his upcoming tour, an amount unheard of for a Latino act in the US. Before the negotiations got underway, the new owner flew in from Hawaii to meet face to face with Juan Gabriel. It fell on me to arrange a meeting with the artist at his home in El Paso. It was just after the New Year in 1988, and he was making his way to Santa Fe for a few days of R&R before heading off on the perennial Mexican leg of a never ending tour heavy on stops at palenques and feast day celebrations. Upon our arrival, we were ushered across an expansive courtyard and into a conference room carved out of what had once been a formal dining room and living room with windows overlooking the courtyard through sheer curtains that made the entire episode seem like a dream. A couple of Juan Gabriel’s aides tended to our comfort as we waited for him to make his arrival. Soon, a figure emerged from a doorway across the courtyard and started making its way toward the conference room. At first glance it appeared to be a woman in a robe but as oddly attired individual came through the door we realized it was Juan Gabriel. The new owner of the top Spanish radio stations in Los Angeles, a Mormon and, formerly, a ten term U.S. Congressman as well as a wealthy media mogul for over thirty years, had run for and narrowly lost the governorship of Hawaii. At the sight of the artist, he appeared a little taken aback. He turned to me and whispered in my ear, “You didn’t tell me he was queer…” And I said back to him, “that’s okay, I didn’t tell him that you weren’t.” Neither Juan Gabriel nor any of his handlers and aides ever brought up the subject of sexuality, and neither did we. Amor Eterno: Homenaje a Juan Gabriel, a Día de Los Muertos Altar & Tribute Concert will be presented by LA Plaza de Cultura y Artes, Thursday, October 27th, 6p.m. -10p.m. 501 N. Main St., Los Angeles, CA 90012. For more in formation, visit www.lapca.org. The concert features performances by Angeles Ochoa, Ballet Folklorico de Los Angeles, Blue Agave, Mariachi Garibaldi, Julian Torres, Stephanie Amaro. Photo: video still from “Have You Ever Seen the Rain (Gracias al Sol) by Creedence Clearwater Revival, recorded for Quiero Creedence, the Latin tribute album to CCR released by Concord Picante. © 2016 Universal Music Latin Entertainment. Richard Vásquez writes from the intersection of community building and marketing as a frequent cultural essayist for Brooklyn & Boyle. Reach him at richard@vasquezassociates.com.